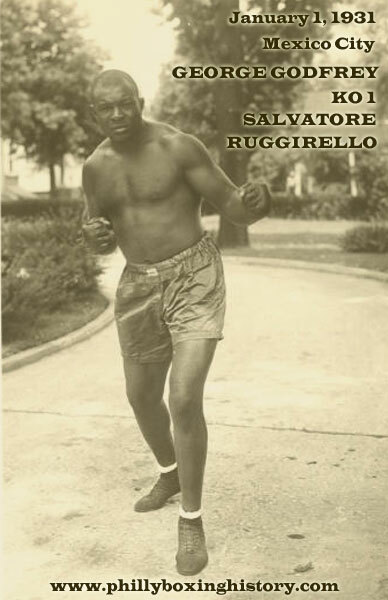 On New Year's day 1931 in Mexico City, George Godfrey, the Leiperville Giant, wasted no time in his scheduled 10-round bout against Tunisian heavyweight Salvatore Ruggirello. After quickly sizing up his 25 year old opponent, Godfrey, 34, stepped right in and slammed a single body blow that was hard enough to drop Ruggirello for the full ten count and end the bout early in round one. The fight was over in less than a minute. Godfrey's record is filled with big wins and bigger KOs - 79 of his 96 victories ended early. He had a wonderful and important career, but because he was black, George was never given an opportunity to fight for the real heavyweight title. Later in 1931, Godfrey would regain the world 'colored' heavyweight championship in a bout against Seal Harris.